Propranolol blocks PLD derived DAG formation by inhibiting phosphatidate phosphohydrolase (IC50=70 µM). It is a useful tool to discriminate between PLC or PLD mediated DAG production. 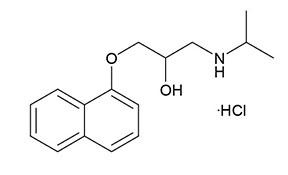 It is also a β-adrenergic receptor blocking agent. Identity: Determined by 1H-NMR and LC-MS.